This post was sponsored, and paid for, by H&R Block. All opinions are my own. Filing taxes may not be the highlight of your year, but it must still get done. Unfortunately, it can be a time consuming process. Plus, in addition to the time it takes to do your taxes, it may also cost you quite a bit of money. This is particularly true if you are using the services of a tax preparer. Many of them charge anywhere from a few hundred dollars to almost a thousand if your finances are complex. So, if your budget is tight, you may be trying to find ways to file that cost less. Below are 4 ways to save on filing taxes. One of the easiest ways to save on your tax filing costs is to keep good records. Maintaining good records all year long is one way to make it easier come tax time. If you seek the services of a tax preparer, having your records organized will save you some money. The easier it is to find information, the faster they can finish and the less you will be charged. If you can put together reports of your expenses, instead of sending a giant box of receipts to your tax preparer, this will save you even more money. 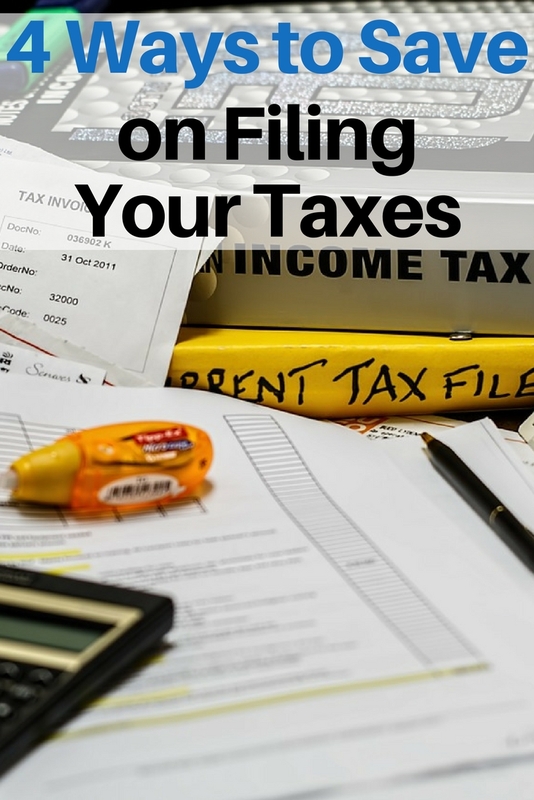 Another of the ways to save on filing your taxes is to prepare them yourself. When your finances are fairly straightforward, you may be able to do so with very little to no help. On the other hand, if you need to itemize, or have more complicated finances, additional assistance may be needed. Tax law and processes can be difficult to understand. Therefore, as stated above, hiring your own tax professional can become quite expensive. Still, you could do your own taxes and just have a professional from H&R Block review them for you remotely. Simply visit http://www.hrblock.com/online-tax-filing/tax-pro-review/ to start your return today. H&R Block’s Tax Pro Review product allows you to file your own taxes accurately and save money too. The cost is anywhere from $59.99 to $89.99 depending on how involved your tax return is. They can check your work to ensure your forms have no miscalculations or other errors. Filing mistakes could cost you extra money. You may end up owing more money to the IRS, plus there may be penalties to pay as well. Having another pair of eyes review your tax return can prevent that. In addition, H&R Block guarantees you get the maximum refund you are allowed. That way you don’t miss out on deductions and pay more money than necessary. Another way to save on your taxes is to choose an H&R Block product to help you with filing. Although it’s more costly than doing it yourself, it may still save you some money. To fit your budget and financial needs, H&R Block offers more than one kind of tax filing product. Choose the one that works best for you and then just add on H&R Block’s Tax Pro Review to ensure you save as much as possible. Plus, filing your taxes remotely right from your own home is easy and convenient. That means no lugging huge boxes of financial documents to a tax preparer. Instead, you can do you taxes on your couch or from your favorite chair. Don’t delay if you want to save on filing your taxes. The sooner you do it, the less likely you are to panic and make mistakes on your return. You can also avoid filing an extension simply because you waited too long. When you file an extension, you will have to pay a penalty and possibly even interest. That is money that you could keep in your own pocket just by filing your taxes on time. Looking for ways to save on filing taxes can keep more money in your pocket for other needs. But, to ensure you don’t end up with costly errors or other problems, enlist the help of H&R Block’s Tax Pro Review.